Jon Athan: Enter The Vortex Vol. 1 is coming July 2nd, 2015! Enter The Vortex Vol. 1 is coming July 2nd, 2015! Enter The Vortex Vol. 1 is the introductory chapter for this new series — it's the first installment, after all. The stories include The Vortex, Nightmare on All Fours, Five-Finger Discount, The Puppeteer, and Remedy For The Not So Common Nightmare. These stories are surreal and unsettling — expect the unexpected. If you're a fan of shows like The Twilight Zone, you'll probably recognize some of my inspirations. (It's one of my favorite shows.) With that said, I don't want to spoil more, so I'll keep the details at a minimum. 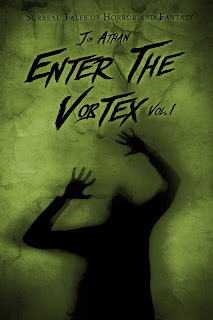 As previously stated, Enter The Vortex Vol. 1: Surreal Tales of Horror and Fantasy releases exclusively on Amazon.com on July 2nd, 2015! You can purchase the book at the very special and affordable introductory price of $0.99 — that's a dollar for more than an hour of surreal entertainment! As usual, thank you for all of the support! Your constant readership is... spectacular! I sincerely hope you enjoy this new series. Writing Updates for June 2015! Restless Nightmares Vol. 3 is available now!